Finally in Sorrento comes the White Night! In the night between the 17th and the 18h of December 2010, from 7 p.m. to 4 a.m. will arrive a series of unmissable events that will affect the entire city. Exhibitions, concerts, wine and food itineraries are just some of the initiatives organized by the municipal Sorrentine Assembly. The heart of the event is held around the old part of town, with the formation of a pedestrian zone, allowing people to move quietly, without having to disentangle from city traffic.The choice of events is definitely varied, making the white night in Sorrento interesting for any target. From the luna park Playground in Lauro Sqaure and art exhibitions which will characterize the streets of the old town, to the gastronomical booth in Sant’Antonio sqaure and the antique market in Piazza Veniero. A lot of space will be given to classical music concerts: from the Correale museum, jazz in Piazza Antiche Mura, to the disco in the Correale parking. The evening will conclude, then, in Piazza Tasso, with the production of an artist of a national repute, still not announced. Sorrento holiday lights lit by one will be waiting for you, in the night between the 4th and 5th December, to give you an evening of fun and great emotions. 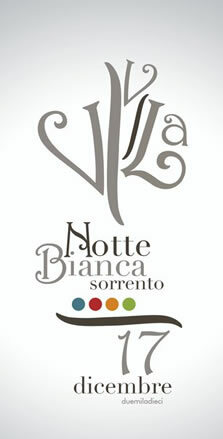 For more information, visit the official website of the Notte Bianca Sorrento.